Now with Windows 8 if we have downloaded a file from Internet or saved an attachment from Outlook that was sent to us and we are certain about its safety, we can disable the Protected View straight away from the desktop. All we have to do is to locate it, right click on it and from the shortcut menu that appears we must select the command Properties as shown in the image below. Once the command Properties is selected, the Properties dialog box appears as we can see in the image below. All we have to do is to make sure the General tab is selected and from the bottom right corner next to the Security area we press the Unlock button as shown below. 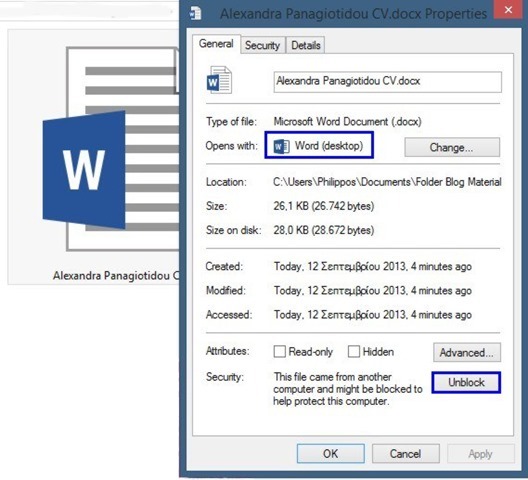 We notice also the description mentioning that This File Came From Another Computer And Might Be Blocked To Help Protect This Computer. Once the Unlock button is pressed it disappears and if we open the file the Security Warning will not appear anymore. The same procedure stands if we do the same with a Word 2013 file as we can see below. 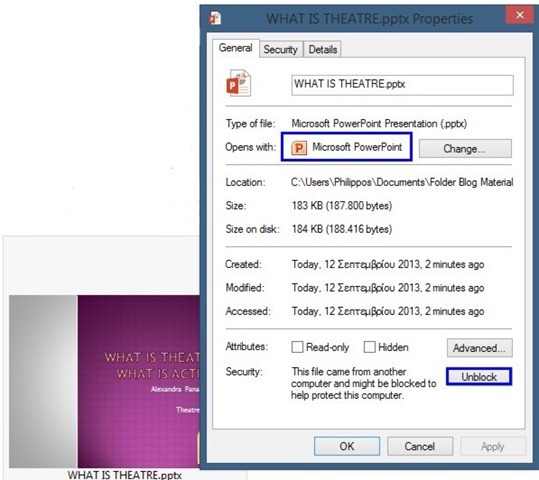 The same procedure stands if we do the same with a PowerPoint 2013 file as we can see below. 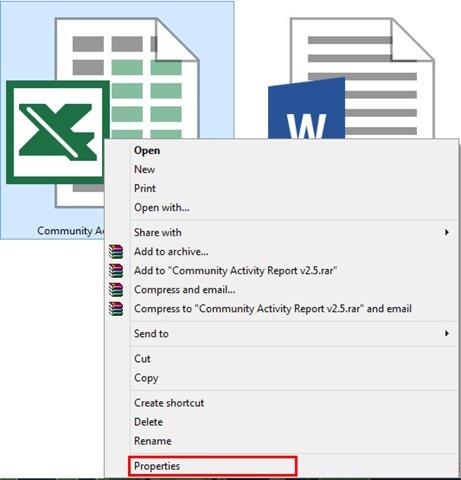 In my next post I will describe further details about Protected View in Excel 2013, such as forcing a file to open in Normal View and some other details about Trust Center. 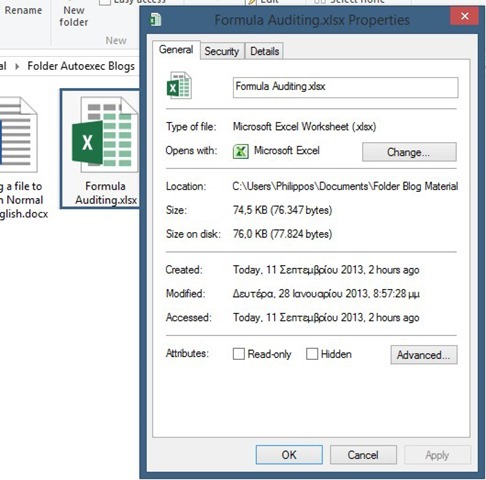 Below you can check out the video about how to Unblock a Office 2013 file from your desktop. Posted on September 17, 2013, in Microsoft Office 2013 English, Office 2013 English and tagged Advanced, Microsoft Office 13, MVP, Office Smart, Office System, Protected View, Security – Unblock An Office 2013 File, Security Warning, Smart Office, Trust Center, Unblock. Bookmark the permalink. 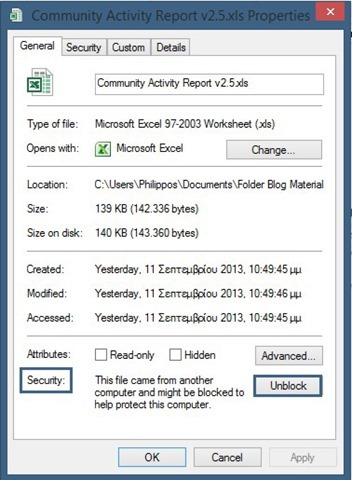 Comments Off on Security – Unblock An Office 2013 File.